Red velvet brownies with white chocolate buttercream frosting: Chewy, dense, red velvet brownies topped with fluffy white chocolate buttercream frosting. These brownies are the real deal in the red velvet world! For the past three weeks I’ve been craving a yellow butter cake with vanilla Swiss meringue buttercream frosting. This post obviously isn’t about that cake. 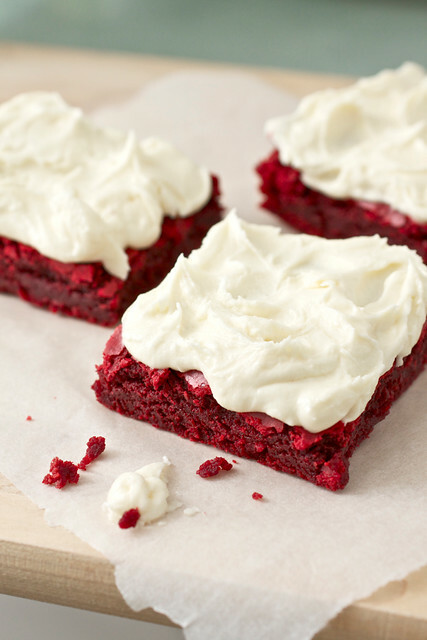 It’s about these red velvet brownies with white chocolate buttercream frosting that I nearly had to wipe the drool off of my keyboard from when I came across the recipe. I kid you not. They are chewy, dense, bright red red velvet brownies, as in my opinion, all red velvet brownies should be. And guess what? They’re topped with a fluffy white chocolate buttercream frosting that ACTUALLY tastes like white chocolate. These are the type of brownies that will make your old Aunt Rhonda kick herself for not thinking to bring to the church picnic before her old rival, Harriett, did just that. They’ll make people swoon and clamor over each other for seconds. You’ll watch these babies disappear and you will beam with delight. And get ready because people will be asking you for the recipe. Trust me! 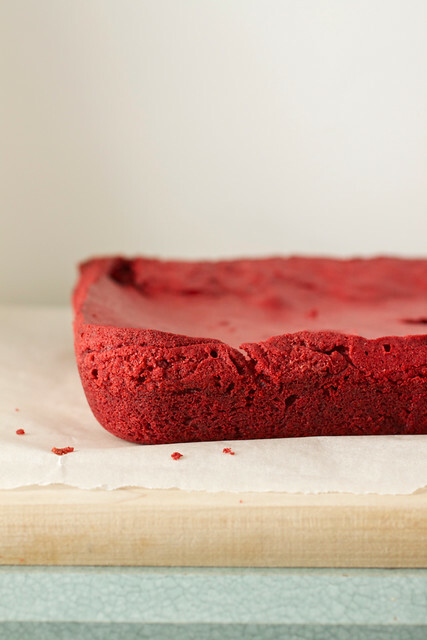 So let’s get down to the nitty gritty of how to make red velvet brownies. Let me first say that I’ve only made one other red velvet recipe in my life before this recipe and I had forgotten about the destructive power of red food coloring. So, be prepared to go slowly when it comes time to add it in this batter. Fortunately, the recipe seems to compress the mess because you’ll stir together the cocoa powder, food coloring, and some vanilla into a paste that you’ll add to the batter. This is done in place of pouring all of the food coloring into a whirling mixer. That’s a disaster waiting to happen! The brownie batter is a fairly basic one to make! 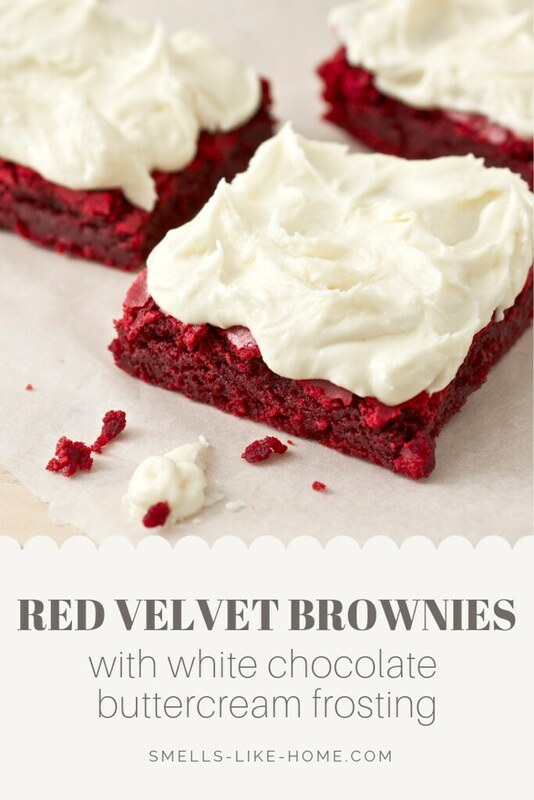 And for the love of all things good, please don’t use a red velvet cake mix to make these brownies! You only need butter, sugar, flour, eggs, and salt in addition to the cocoa powder, red food coloring, and vanilla extract to make these red velvet brownies. They couldn’t be more simple to make from scratch! The white chocolate buttercream frosting is insanely sweet and I almost thought it was too sweet. Is that even possible?? But by the next day, the white chocolate flavor seemed to blossom and the sweetness had diminished just a tad. Because of this, I highly recommend making the frosting a day or two in advance and sticking it in the fridge until you’re ready to bake the brownies. You’ll need to give the frosting some time on the counter to come to room temperature and when it does, give it a good stir before you frost the brownies. Whatever you do though, don’t wait another millisecond to make these red velvet brownies with white chocolate buttercream frosting. You’ll be kicking yourself when they show up at your next party and someone else will be doing all the beaming. [9.2.11 Update] Note: I’ve edited the bake time of the recipe below to better reflect the comments people have left about the brownies being undercooked at 30 minutes. All ovens vary so use your best judgement and the toothpick test to ensure doneness. 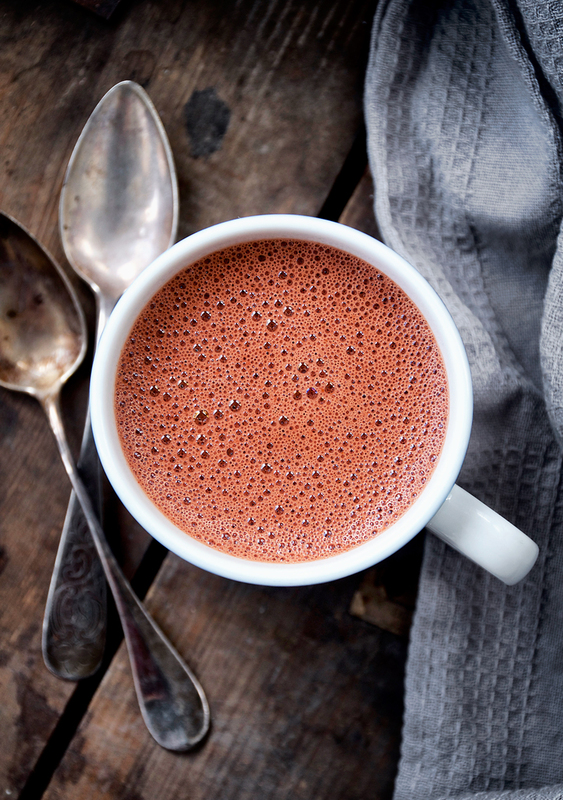 Looking for More Red Velvety Goodness? The white chocolate buttercream for these brownies is VERY sweet. I strongly suggest making it a day or 2 in advance as the flavors will meld and the sweetness will mellow a little the day after you make it. To make the brownies: Preheat the oven to 350 degrees F. Butter and flour an 8×8-inch baking pan. In a small bowl, slowly stir together the cocoa powder, food coloring, and 1 tsp vanilla into a thick paste until no lumps of cocoa remain. Set aside. In the bowl of a stand mixer fitted with the paddle attachment, beat together the butter and sugar on medium speed until light and fluffy, about 2 minutes. Add eggs one at a time, mixing well after each addition, then stir in the remaining 1 tsp of vanilla. With the mixer off, add in the cocoa mixture, then turn the mixer to medium and beat the two mixtures together until they are one uniform color. Slowly add in the flour and salt and mix on medium-low speed, just until combined. Do not overmix. Remove the bowl from the mixer and stir up the batter with a rubber spatula once or twice just to ensure all of the flour has incorporated from the sides of the bowl and there isn’t anything stuck on the bottom of the bowl. 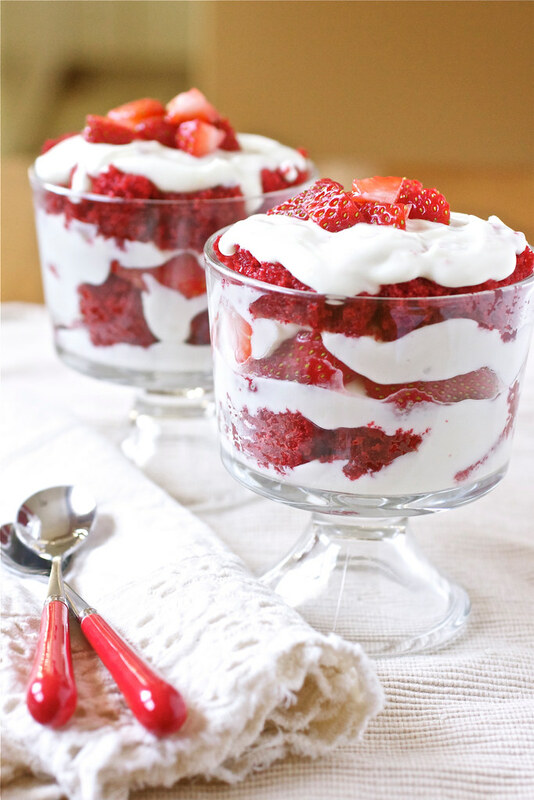 You’ll want one uniformly colored (red) batter. Pour the batter into the prepared pan. Bake for 30-40 minutes or until a toothpick comes out clean when inserted into the center of the brownies. Allow brownies to completely cool in the pan on a baking rack, about 45-60 minutes. 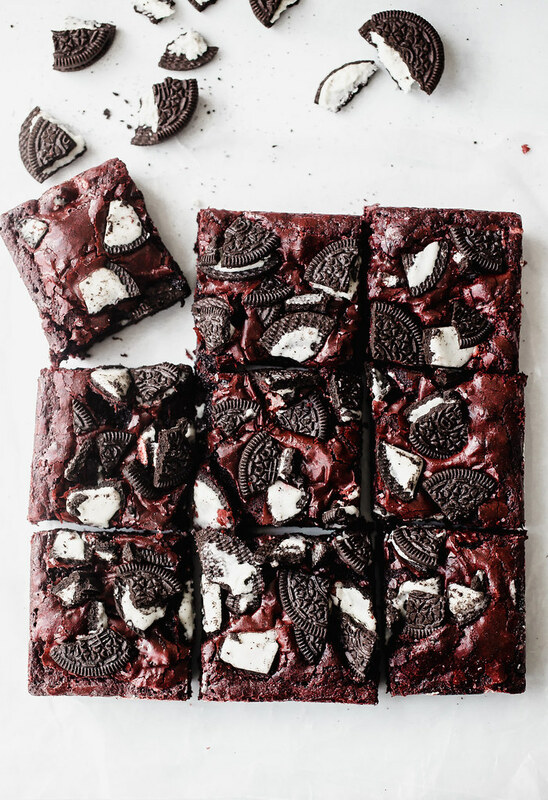 Frost brownies in the pan, cut into 12 bars, and serve, or remove the entire batch from the pan to a cutting board, cut into 12 bars, frost, and serve. To make the frosting: In the bowl of a stand mixer fitted with the paddle attachment, cream butter until soft and fluffy then beat in the vanilla. With the mixer on low speed, slowly add in powdered sugar 1/2 cup at a time; allow the sugar to mix in before adding the next 1/2 cup. Once all of the sugar has been added, beat on medium speed for 30 seconds and scrape down the sides of the bowl. Add in the melted white chocolate and beat on medium speed until incorporated. With the mixer on low, add in heavy cream 1 tbsp at a time and beat at medium speed until the frosting has reached your desired consistency.